Lake Texoma lake elevation is 616.52 and water temp is 71-74 degrees. We are slowly starting to see some of our better stripers starting to show back up. Compared to this time last year our water temp is about 6-8 degrees warmer. With the cooler nights and shorter days we shoud start to see the temp steadily fall. 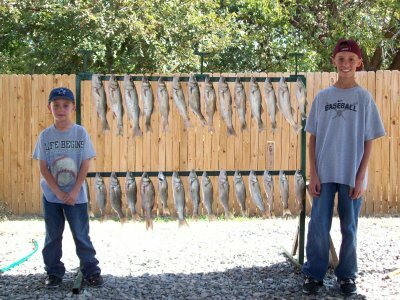 Once we get to the mid to lower 60's the Lake Texoma fall fishing should be back in full swing. A lot of our stripers are still hanging around the shallow flats in 5-15 ft of water. The good news is that they have finally started to move to some of the other flats thru out the lake. For the past 6-8 weeks the only place we've found large numbers of stripers has been to the west of Highport Marina and the amount of boating traffic has been extremely heavy. Now our Lake Texoma stripers are being caught from the HWY 70 Bridge back to Washita Flats, Platter Flats and Mac Flats. Fish are staging in the deeper water off the flats and running the baitfish shallow to feed. We're still fishing bait, mainly gizzard shad with some threadfins mixed in. Drifting has worked better for me. The anchor just seems to attract the small catfish. 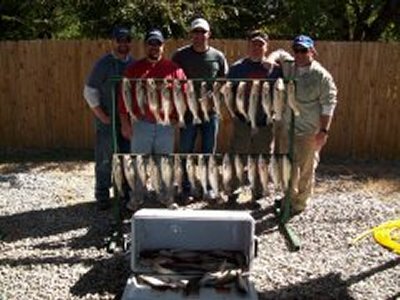 As the cooler weather moves in the next couple of months, it will be prime time to come out and fish for a Lake Texoma trophy striper. So come out and enjoy your day on beautiful Lake Texoma.